Don Mattingly has taken a lot of heat this season, a lot of it warranted. One of the biggest issues has been his bullpen management. 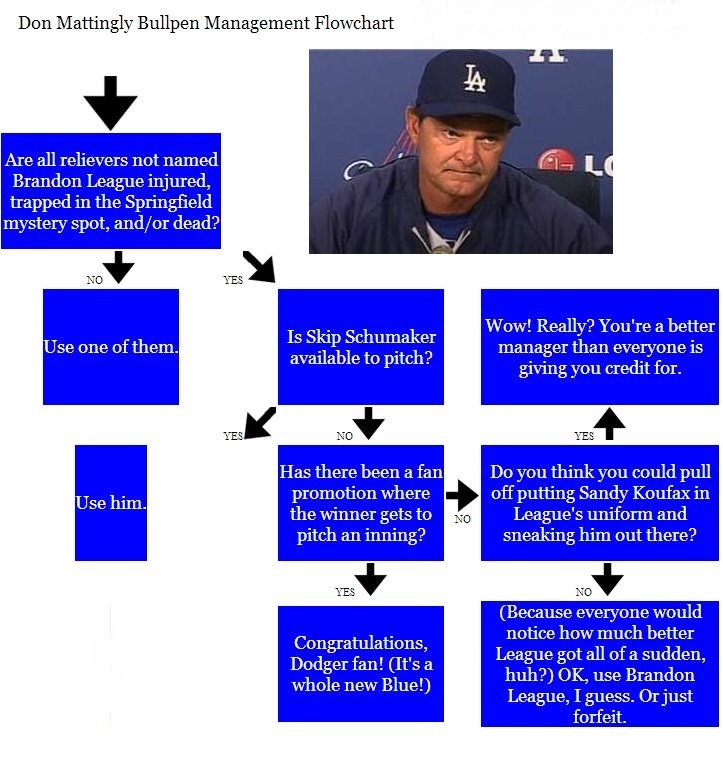 Don's sometimes questionable decision-making reared its head again last night, when he went with Brandon League in a save situation and he nearly burned Dodger Stadium to the ground. Feel free to print it out and tack it up in the dugout, Mr. Baseball, sir. It's the least I can do. It's time to put League on the DL for a pulled extensor digitorum longus or something. I couldn't copy, it but copied the link and put it on FB and to the fire don mattingly fb page! Classic. It seems that everyone knows Brandon 'minor' League is an arson. Everyone except Donnie of course.